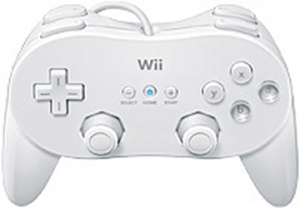 Nintendo of Japan's website has recently had an update which now includes an additional Wii controller, the Classic Controller PRO. The new controller seems to be extremely similar to the existing Classic Controller but has the additional shoulder buttons (found on Gamecube) and a more Gamecube controller shape. The website states the controller will be available this summer and we'll take a guess that it'll come to European and North America shortly after. The reason behind this new controller is mystery, it's hard to know what Nintendo are up to. It could just be so that people can play Gamecube games with this controller - or it could mean we're going to see more recent Virtual Console games - Dreamcast, Gamecube itself perhaps? or potentially it could be used for Wii games that want to use a more original shape. Obviously we'll find out more over the next few months. I wish it had turbo. Emulation of the dreamcast would be next to impossible on the Wii, due to the lack of power. Gamecube games would be a possibility, due to the fact that the Wii has the same hardware as a gamecube (so the emulation rules don't apply), but would be a bit too big (due to the encryption that Nintendo use on original gamecube games at least, they have to be 1.5GB in size exactly. the Wii's NAND is 512MB. Oo-er...). 3) They're releasing it for more comfortable control with future games, possibly those ones that are just spruiced up gamecube games. We can't totally rule out the Dreamcast possibility. After all, the games could just be slapped on a compendium disc. We've seen CD to GC conversions with Skies of Arcadia. But I must admit, it does seem an unlikely solution. @linktothefuture: only cheats use turbo pads... cheat! @Muzer: It's most likely because many were complaining about the tiny controller and awkward Z button positioning on the current pad. Also, there is a slight possibility that Dreamcast games could be released. Obviously they are very big, but when compressed, they might just manage it. Okay, so it's unlikely, but Nintendo have still got a storage solution that they'll be announcing soon, so don't rule anything out. @Nanaki: Dreamcast emulation would be next to impossible on the Wii. Sure, SoA was ported to GCN with extras, but that's totally different. Now, it would be technically possible to port simpler, smaller games from Dreamcast to WiiWare, but I don't see the point. I mean, Chu Chu Rocket, Wetrix, Bust-a-Move (4), and Mr. Driller could all be suitable candidates, but it's much more worthwhile for them to just make a new game. At least they are with Mr. Driller. @mogleum: Yeah, I relaise that emulation is practically impossible. That's why I suggested a compendium disc- port the games everyone wants to a Wii format. I realise I was a bit unclear in the last post there- my bad! It's an arduous process, granted, but there might be some titles that justify it. I would bathe in a sea of a thousand lions to play a new ChuChu Rocket game. I adore my Dreamcast (of course) but I think keeping Dreamcast games where they belong is the best bet - look at the flak Nintendo are getting for porting last generation stuff to Wii! If a revamped Samba de Amigo didn't sell on Wii, I can't see a disc full of Dreamcast classics faring much better, sadly. Don't make me buy it a third time Sega, please... I still haven't completed it! Gamecentral had the great idea that third party PSone games might make their way to the Wii. Hell - Microsoft did it with N64's Banjo (and I know that that's because they owned Rare), so there could be a chance!